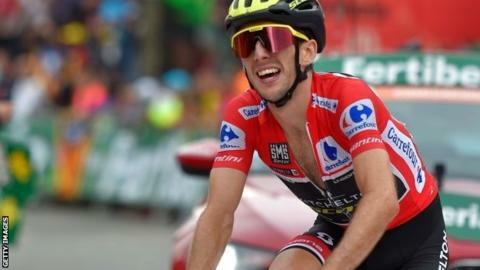 Britain's Simon Yates will win a first Grand Tour after finishing third on the Vuelta a Espana's penultimate stage. Yates leads stage 20 winner Enric Mas by one minute 46 seconds with Sunday's processional race to Madrid to come. It is the first time Britain have won all three Grand Tours in the same year with Chris Froome's Giro d'Italia title and Geraint Thomas' Tour de France win. Only twice before has one country won all three races in the same season, but this is the first time it has been done by different riders. And Yates' victory will be the fifth Grand Tour triumph in a row for Britain after Froome also won last year's Tour and Vuelta. "Finally I think it's sinking in," said Yates. "I'm incredibly proud, and incredibly proud of the team also, they carried me through the entire three weeks. It's the first Grand Tour win for the team - it's unbelievable."